Have you seen someone sleeping rough? Are you worried about someone who may be sleeping on the street tonight? If you know someone who could use our help, simply complete the form below, call us on 0300 123 2041(low cost) or e-mail. The Whitechapel Centre is co-ordinating the Liverpool outreach response to rough sleeping as part of the Always Room Inside campaign. 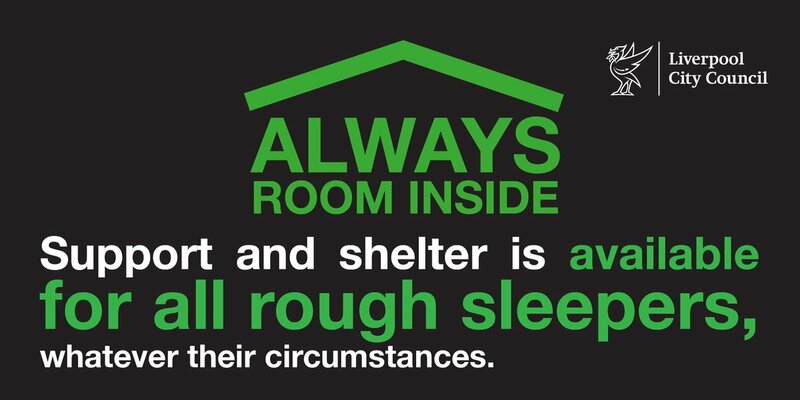 By providing us with information about someone you think may be sleeping rough you will be helping us ensure no one ever needs to sleep for a second night on the street. Our vision is that no one will live on the streets of Liverpool and no individual arriving on the streets for the first time will sleep out for more than one night. Through dedicated outreach services we will provide a rapid response to ensure appropriate solutions to rough sleeping. Help us to achieve this and ensure no one sleeps on the streets of Liverpool for a second night by telling us about anyone you think may be sleeping rough.